Nissan Qashqai Interior, Sat Nav, Dashboard | What Car? 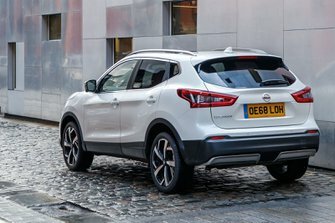 You shouldn’t have much trouble getting comfortable behind the wheel of the Qashqai. The steering wheel, seat and pedals are well aligned and there’s a helpful range of adjustment for the seat, while the steering wheel moves in and out as well as up and down. Adjustable lumbar support on the driver’s seat is standard on all but entry-level Visia models. Go for the Tekna and you get a powered driver’s seat, and Tekna+ adds four-way electric lumbar adjustment. All the main switches and controls are easy enough to reach as well. The Qashqai has the kind of mildly elevated driving position you’d expect from a family SUV, so you get a good view of the road ahead. Things aren’t perfect, though, because the windscreen pillars are quite thick and can create blindspots at intersections. The rear pillars are even more substantial and – combined with a narrow rear window – make over-the-shoulder visibility worse than in the Skoda Karoq. Given this fact, it’s a shame rear parking sensors aren’t standard on entry-level Visia models. Upgrading to Acenta Premium trim gets you front and rear parking sensors, while N-Connecta models and above add an Intelligent Around View Monitor – providing you with a 360deg bird’s eye view around the car – and a self-parking system. You’ll need to go for Tekna or Tekna+ if you want LED headlights for better vision at night. The Qashqai’s infotainment system comes in two distinct grades. Visia editions get a rudimentary system with no touchscreen, although you do get a USB socket, Bluetooth connectivity and a DAB radio. 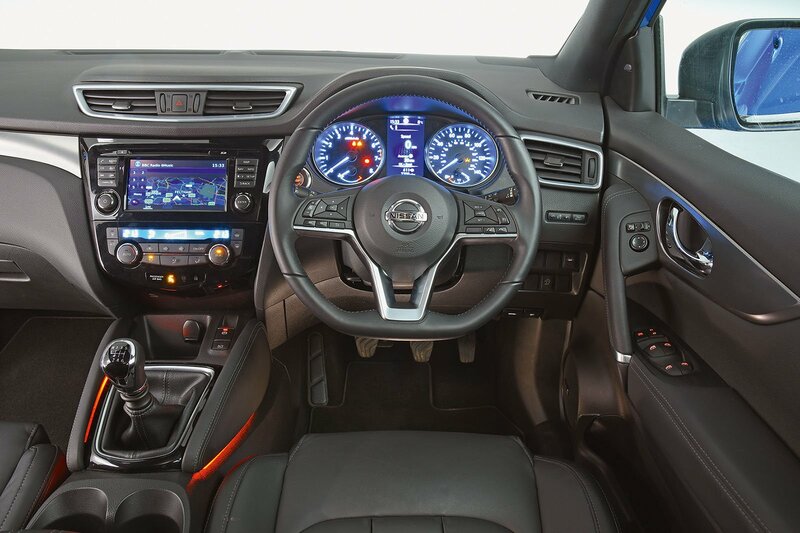 Move up to Acenta Premium and you get Nissan’s Connect system, which is operated through a 7.0in touchscreen at the centre of the dashboard. It also comes with a DAB radio but adds a host of additional features, including sat-nav, Apple CarPlay and Android Auto smartphone mirroring and 3D mapping. You can also download an app to add remote services such as to find your car (if you’ve forgotten where it’s parked) and to send destinations to the sat-nav. The system can also be updated via wi-fi, rather than you having to traipse to a dealer for software upgrades. However, even this range-topping system isn’t as slick to use as the better systems in the class, such as that fitted to the Skoda Karoq. The Qashqai’s touchscreen is lower in resolution and can sometimes take a while to respond when you prod the screen. 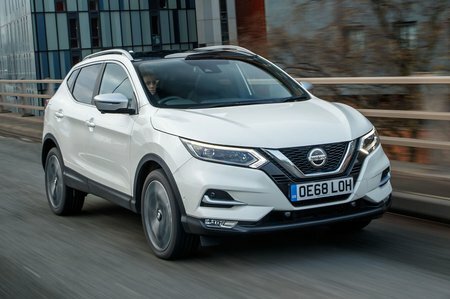 The Qashqai can’t match the best family SUVs for interior quality, but it’s far from cheap-feeling inside. The dashboard uses dense, soft materials in most of the areas you’re likely to touch regularly, and the buttons and switches operate with a solid, reassuring action. Higher-end models get swish ambient lighting and a glossy piano black finish around the colour screen in the centre of the dashboard. Overall, the Qashqai is roughly on a par with the similar-priced Seat Ateca for interior quality, but the Skoda Karoq looks and feels classier still.